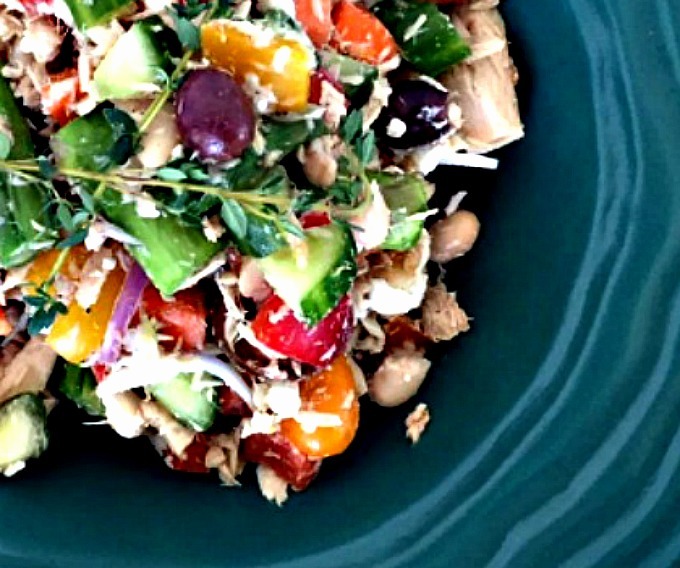 Make my Tuna Vegetable Salad when you’re craving springtime in a bowl. With plenty of crisp colorful veggies packed with flavor, plus your protein of choice for a complete and satisfying meal. Have you ever been starving and looked in your refrigerator only to find nothing that appeals to you? That’s what happened to me yesterday when I tried to find something for lunch. Instead of running out to the store or to get a carryout I looked to see what I had stored in my refrigerator drawers, cabinets and pantry. To my surprise I was able to come up with a dish that was so good, I’ll be able to eat it through the weekend. Creating dishes from what lurks in your cabinets and refrigerator is so rewarding. 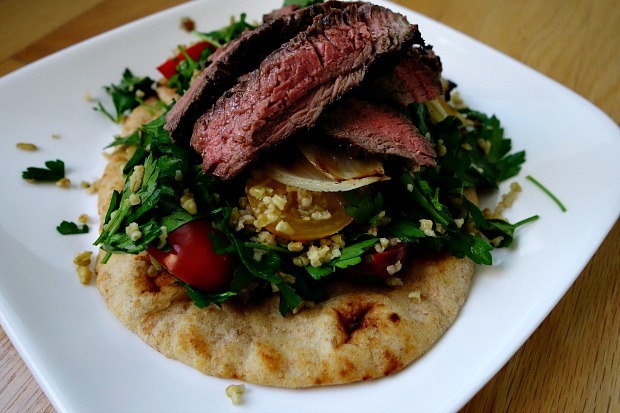 You don’t have to be a seasoned cook to do it. Simply combine ingredients that YOU like, in a fashion that sounds appealing. 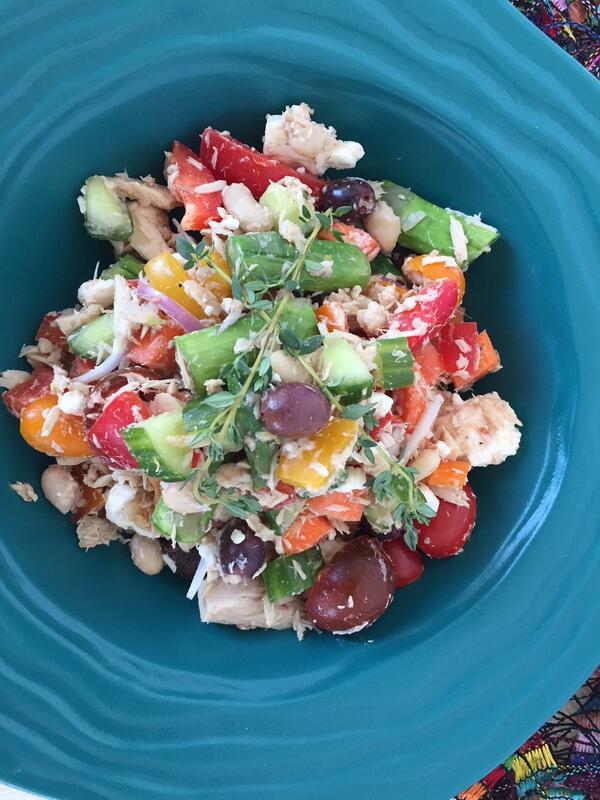 That’s how I came up with this Tuna Vegetable Salad. After gathering up all my ingredients, I took stock of what I had and how I wanted to prepare them. I knew I wanted the salad to feel fresh, and crunchy. Cooking them too long would cause them to lose their nutritional value, crunchiness, and stability. However a quick 1 minute blanching for some would do the trick. I also didn’t feel like fussing too much with the ingredients especially since I was already hungry. I opted for some quick fix ways of prepping. All my ingredients were fresh except, I did use a can of Cannellini Beans. To rid them of the sodium used in packing, I poured them into a fine mesh sieve and rinsed thoroughly removing all salt and thick coating surrounding them. In fact, I do this anytime I use canned vegetables with the exception of tomatoes that require the juices. If you’re not a fan of tuna then substitute salmon, chicken, beef, or shrimp. If you’re vegetarian sub the meat for tofu, or only veggies and beans. If vegan, omit the cheese. If you’re not a fan of beans add pasta, quinoa, or other grain of choice. 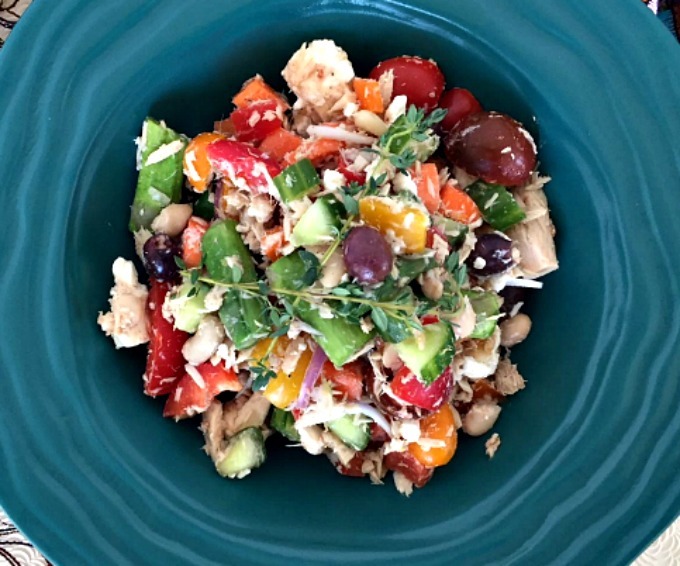 I think you’ll enjoy my Tuna Vegetable Salad for a quick, healthy, and colorful dish. 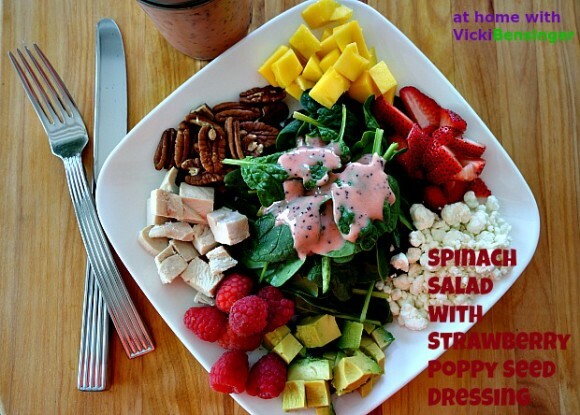 Drizzled with my fresh Honey Lemon Dressing it’s perfect year round and even for an outdoor picnic. Serve in bowls, or lettuce cups, in a cozy wrap, or even mason jars for a picnic or if you’re on the go. 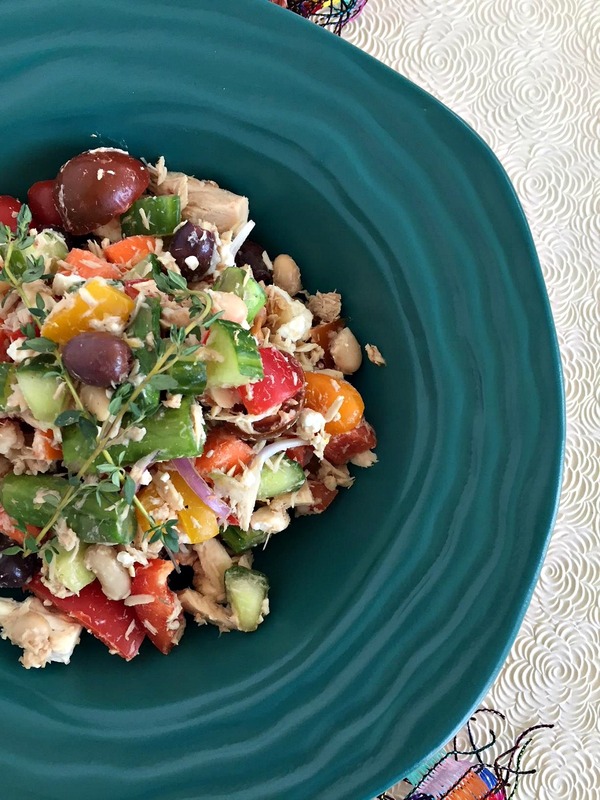 My Tuna Vegetable Salad will soon become your new favorite – just as it has mine! 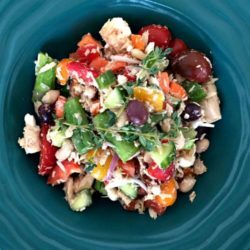 My Tuna Vegetable Salad is so nutritious - packed with vitamins, minerals, crunch, and color, for a light meal, side or picnic. This will quickly become a family favorite recipe in your home! Blanch asparagus. Remove rough stalks at the bottom, rinse and place on a microwaveable plate with water. Place in microwave for 1 minute, remove and rinse with cold water. Alternate version: Set asparagus in boiling water for 1 minute. Remove then plunge in an ice bath or cold water to stop the cooking process. Cut asparagus into 1-inch pieces. Add all ingredients into bowl except salt, pepper, feta cheese and dressing. Chill until ready to serve. Dressing: Make dressing by squeezing the juice of one lemon into a small bowl, then whisking in olive oil to taste until you get the right balance. Add honey to taste, and emulsify. To serve: Add feta cheese, toss with desired amount of dressing and salt & pepper to taste. Toss and serve. 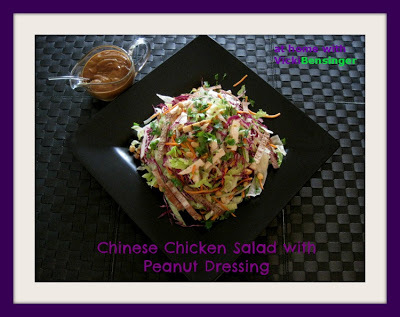 Note: If not using all the salad at once do not add the dressing until using. This will keep the salad with ingredients stabilized for a longer period of time. Sounds perfect for my lunches! And it doesn’t require cooking! And Bill might even eat it if I hoard all the cucumbers! The only thing bad about you not going to Everything Food is that we won’t get to meet in person. Hope we will someday. I can’t remember where you go in Colorado but we’ll be in Beaver Creek for a wedding in June–it will be a very short trip, but if you’re nearby, we MUST work something out. I hope you like it if you try it. Lots of great flavor and crunch – truly refreshing! This is my kind of healthy and delicious lunch! 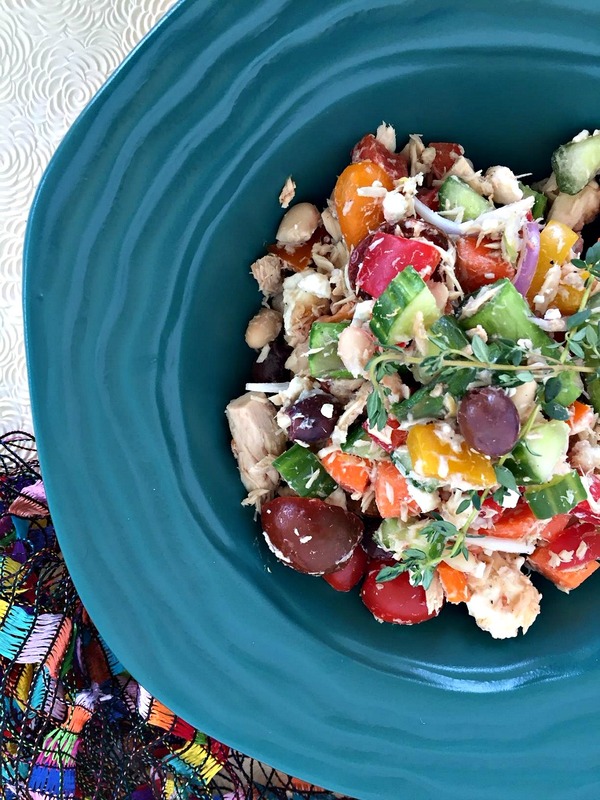 Love how colourful and appetizing it looks..
Great looking salad! Full of flavor, and quick to make — winner! I always rinse the gunk off canned beans, too — they taste much better that way. Anyway, wonderful dish — thanks.